This amazing bright & fresh recipe for Crock-Pot Strawberry Jam is super easy and a great beginner recipe for anyone new to canning. I just ADORE strawberry season. When fresh strawberries are at their juicy sweetness, perfectly ripe and fragrant. Not to mention the best price in the grocery stores and farmers markets. One of our local grocery stores recently has fresh strawberries for 99¢ a lb. which is a stellar deal up here in Wyoming where normally strawberries are $2-$3 a pound. So of course I snatched up a few pounds at that price. Some to eat fresh, some to freeze for smoothies for the kids and some to make some homemade crock-pot strawberry jam! Making your own jam in the crock-pot is SO easy. Seriously even if you are a novice jam maker this has got to be the most easiest recipe ever! You can put up your finished strawberry jam in freezer containers or you can water process jars to make them shelf stable. Either way when you crack open a container and spread some of your homemade jam on some toast, English muffin or even on a yummy waffle your mouth will smile for sure as you taste what can only be described as the best of summer berries! This amazingly simple recipe is a great starter canning recipe for anyone wanting to put some simple and fresh tasting strawberry jam on the table. The taste is bright and sweet and full of the best of summer's berry goodness! Rinse strawberries, hull and slice and place in a 5-6 quart crock-pot. Add remaining ingredients (lemon juice, sugar & pectin) and stir everything together. Before starting your jam place 2-3 saucer size plates in the freezer. To test jam doneness place a spoonful of jam on the cold plate and wait a minute or two. Push the puddle of jam with your finger to see if it is setting yet. If the jam is still runny and saucy cook it longer. Recipe makes approximately 64 ounces of jam. One serving is a tablespoon of jam. This recipe is gluten free diet friendly. We do caution our readers to read labels on all ingredients before using to ensure they are all indeed gluten free. Do you want even MORE Crock-Pot canning recipes? We just added a Canning category here at Crock-Pot Ladies, come and explore some recipes! Jam is definitely on my to-make list! Thanks for sharing on Two Cup Tuesday. Pinned it! Have you tried substituting powdered Stevia for some of the sugar in this recipe? My teenage daughter only takes peanut butter and strawberry jam (or honey) in her school lunches. I am trying to make a more economical and lower sugar option for her. I am looking forward to making this tomorrow. I have not made this recipe but I have used stevia for almost 20 years. In a normal baking recipe that calls for regular sugar, I substitute 1/2 the sugar for stevia. If the recipe calls for 2 cups sugar, I use 1 cup sugar and 1t powdered stevia. p.s. i started using 100% stevia and it does not taste good, .. after trial and error, this 1/2 sugar and 1/2 stevia works very well. living overseas so no pectin. any substitions for that? I am not sure on that one Nancy, I did not realize that pectin was not available in other countries. You could perhaps order it online or make your own perhaps? No, this recipe does not use Jell-O powder. It uses powdered fruit pectin (found in the grocery store by the canning supplies). Their point was that there is pectin in jello. In the past I have done recipes without pectin by finding a recipe that has apples in it. Try to find one like that. Hi Melanie, This recipe does not contain Jello it contains pectin. Jello contain gelatin not pectin and would not work for this recipe at all. Store bought pectin that you use in normal canning recipes is what I used in this recipe. Thanks for the tips on using Chia seeds Annette. I have not had the chance to try that yet! Can I make this with splenda or artificial sweetness? While I have not made this with Splenda myself I don’t see why you couldn’t. Did you do the plate test to check for jellying on your jam? It set up after 4-5 hours. Cooked mine for the full time and exactly the way the recipe says. After the 5 hours my strawberries are burnt and did not set up at all. Very upset that I just wasted 4 pints of strawberries and all that sugar. Will continue making jam the old fashioned way. Sorry to hear that Shoshana. Perhaps your crock-pot cooks at a higher temp. Mine didn’t set up either. 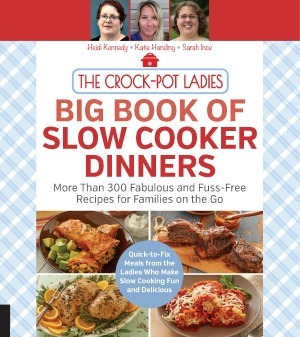 Great idea, I love crock pots, but it doesn’t thicken up. I made strawberry jam as instructed in crock pot and even waiting overnight it has not thickened..help! I am not sure why it has not thickened for you. I have made this recipe several times over and it always comes out just fine. Did you test your jam on a cold plate from the freezer to see if it has jelled? In the crock-pot it is going to be runny while hot. It thickens as it cools. Do you let it cool before canning in hot water bath? Great questions Lindsay! You do not let the jars of jam cool before canning in the hot water bath. In fact your jam should be hot going in. Never have I been so upset with a recipe not turning out than I am right now. I wasted 5 hours of my time today and 4 pints of strawberries that were hand picked by me. I want to cry. I tried the plate thing and everything. Still runny and did not set. I was really excited to try this today too because I have never tried old fashioned canning before. I guess I am now!!! Very disappointed!!! Amy, I am so sorry your jam did not come out. I don’t know what else to say except that I am sorry. I have made this recipe several times now and it always comes out for me. I am not sure if it is the type of pectin folks are using or if their crock-pots cook at a lower temperature or what. We have had several readers say it works for them and a handful that it didn’t. You could always try putting your not thickened jam in a heavy bottomed pot and simmering it on the stove top until it thickens and then can it. Otherwise the runny jam can always be used as a strawberry syrup or ice cream topping. I guess I have to agree with the rest of the people who commented on this. It didn’t work and spent 5 hours and did the frozen dish test and gave up. Now I have 5 containers that are liquid. Something has to be wrong with the recipe, there is no way with something that simple and many have said it doesn’t work. I am sorry it did not work out for you. I will test the recipe again in the next few weeks and see if I can pinpoint what the issue might be. As I have stated before in other comments I have made this several times now and have never had an issue. I am sorry the recipe did not work out for you Deb. Did you test the jam on a frozen plate to make sure it had gelled? After reading all this I will stick to freezer strawberry jam!